My weekly email from Dan Kennedy arrived in my inbox this morning. His comments about taking action in business are perfect and are a bull’s eye in terms of exactly what needs to be done to be successful. Results are paid on actions taken. Not on actions thought about and never taken. “You never bet enough on a winning horse. In your own business, this is easier in some ways, harder in others – but the object is to act on what you see clearly, regardless of whether anybody else sees it or not, regardless of opposition, now not later or someday. Incurring risk of being wrong is essential for being right to matter. Incurring risk, mess, ire of others is what you get paid the big bucks for – not just for being right. Action is what you get paid the big bucks for – not just for being right. Conviction towards an action, and taking that action, with clarity, are the keys to a successful life. If you do not believe in your own success, find someone who does believe in you, and listen to them. Don’t die with the music still in you… back yourself. My final public speaking presentation for 2017 showing Dentists how to grow their Dental practices will be at a Symposium on growing your Dental Practice in 2018 in Sydney Australia on Saturday December 2 2017 with leading experts Kinnar Shah, Angus Pryor, Jayne Bandy and Toni Surace . Charging Cancellation Fees? Never A Good Idea…. I received an email from a dentist this week asking about the best way to charge cancellation fees. Charging cancellation fees in a dental office is a big concern in this day and age as people and patients become so “instant”. “My wife and I are torn at the moment regarding late cancellations and fees. We currently have an automated software system that sends patients an email a week before their appointment, then a text message the day before the appointment to confirm. Both tools giving the patient the option to reschedule if it doesn’t suit them. We are split in terms of opinion when charging late cancellation fees to first time offenders. We had a one strike rule where they would be let off on the first occasion but then started to charge $40.00 for any further failure to attend or late cancellation if the space could not be filled. For some background: We split our patient profiles into A patients, B patients and C patients. The latter being patients we don’t want and that waste our time resources and actually cost us money. The two former being our target conversions and ideal type of people we want to attract into the practice. It has had a mixed response from patients when they are being charged but it has been communicated in a very caring manner when the receptionist mentions that the dentist will be lying idle for that hour and we have a long waiting list of people looking to see us and you have wasted that space. This is a really great question being asked by this doctor, and is a problem for so many dental offices. Let’s break this down into a few of its sub-components and see if we can get a very valid solution going here. Firstly, why do people cancel and no-show for dental appointments? The reason this happens is simple. This happens because our patients do not CLEARLY understand the reasons why they are coming back for their next appointment. When the patient is unclear they will defer or no show. After all, most of the time the patient is returning for us to fix something that is not hurting them, and it is usually something that they were not aware of. So we need to let the patient know exactly what we are going to do. And we need to be sure they understand us. When the patient is totally clear, then they will attend. If we allow a patient to leave our office or to get off the phone after scheduling without them being totally clear as to the reasons why they are scheduling, they will cancel, and we as their health care practitioners have now let our patients down. Here is what the patient needs to know, EACH AND EVERY TIME. And if a change to our schedule arises, then the doctor will want to see you sooner. When we visit each and every point on this checklist each and every time we schedule an appointment then we dramatically increase our patients’ attendance rates and decrease their no-shows. So long as our patients have that CLARITY. We must ensure that the patient has understood and has committed to us [verbally] that they have understood. There is no point in us making appointments and “hoping” that our patients will keep those appointments. There must be clarity. And commitment. Secondly, don’t leave the windows open. Confirm the appointment at the time of scheduling the appointment. And close the open window. And their answer is secured. Be as definite with your scheduling at the time of scheduling. Also, when you allow an automated process to give patients an exit from an arrangement they have previously secured, you are creating open windows for your patients to escape through. Don’t allow your staff to speak in this manner either. All this message serves to do is to say that patients could secure a time for as long as they want, and then could cancel with our blessing as long as they give more than a day’s worth of notice. Of course that is so wrong! How many times could we have filled that appointment if we’d simply had more advance notice of the cancellation? Lock the appointments in with definite language. Thirdly, reliance and dependence on automation over people-contact increases the number of cancellations and no-shows. Our patients will feel less guilt when cancelling to an automated message or automated text. If your office can actually have a human being providing the “courtesy call” you will dramatically increase your attendance rates. We have not called to “confirm”. Adults hate to be confirmed. We have not called to “remind”. Adults hate to be reminded. We have not granted them permission to reschedule. When scheduling the appointments, don’t intimate to the patient that you will be calling or contacting them to remind them. Just do the courtesy contacts anyway. I remember discussing this with a female periodontist. She said whenever she makes an appointment with her hairdresser, they simply just make the appointment. A couple of days prior to the hair appointment she receives a text message on her phone. At no time do they tell her they will be texting her a courtesy message. They simply do it. As a courtesy. Not as an escape route. The email from the dentist above shows that he and his wife are definitely on the right track in terms of identifying their target markets and the types of patients they prefer to be treating. Most dentists don’t do this. Most dentists simply try to be everything to everybody. And in the end they finish up failing to be anything significant to anyone. By identifying the types of patients that you enjoy treating in your dental office you can focus on attracting and pleasing and keeping more of those patients that make your life enjoyable. Twenty to twenty five percent of the population are happy to pay your fees and don’t care what your competitors are charging, simply because they believe you are doing a wonderful job. Focussing on these people will provide you with eighty percent of your income. These people will not cancel and reschedule on you. Because they value you and what you do, and how you treat them. Attracting more of these people should be the goal. Should you charge a cancellation fee? I never charged a cancellation fee. However, I did terminate patients who became repeat offenders and serial offenders. Should you have a cancellation policy? I don’t believe any business should have “policies”. The display or existence of a “cancellation policy” is an indication of a loss of control. Focus on clarity and necessity of treatment. And understanding. And do business with those people that you want to do business with. My next public speaking presentation showing Dentists how to grow their Dental practices will be at a Symposium on growing your Dental Practice in 2018 in Sydney Australia on Saturday December 2 2017 with leading experts Kinnar Shah, Angus Pryor, Jayne Bandy and Toni Surace . Team Unity. Real Or Not Real? One of the interesting things that sometimes pops up from time to time in dental offices across the world is the situation when a lack of unity exists between teams and team members in those dental offices. It is sad to see this when it occurs. Lack of harmonious team unity is something that is not exclusive to dental offices. Whenever any organisation begins to expand, there will always be cohesion issues between the various component parts of that organisation. You know the types of discussions that occur in dental offices? There is always a point of difference of opinion between those who work up front in a dental office and those who work down back as to whether one sub-team works harder than the other, and which sub-team is the most important when it comes to being the backbone or the spine of the dental office. Because after all, if it wasn’t for the efforts of the front office team there would be no patients in the schedule for the back office people to see? And of course, if the back office people did not treat the patients well then the front office team would have a devil of a time getting those patients seen down back to schedule for any further ongoing treatment. Of course, if it were not for the hygienist being there the dentist would have to be cleaning teeth and we know that he can never do as good a job as the hygienist? Or should the hygienist be more appreciative that the dental office is so so popular that the dentist has so many wonderful patients returning for hygiene visits? Should the hygienist be pre-identifying dental restorative issues in their patients and bringing those issues to the attention of the patient and the dentist? Or is the hygienist purely periodontally-focused only? Should the hygienist help in scheduling the hygiene patients? Or is that a front of office duty? If the hygienist [or the dentist for that matter] has time should they help with set-ups and steri? This is not a pleasant phrase to hear uttered in a dental office. A piece of trash lies by the entrance to the front door of your dental office….who should pick up this trash? An empty cup and saucer have been left in the client lounge area beside an untidy stack of magazines…who should tidy that area? A picture in the hallway hangs crooked? Someone has left a black scuff mark on the floor in the hallway…. Whose job is it then? Working together as a team is everybody’s job. There can be no us and them. There can be no “But that’s not my job”. What there must be is harmony and positive mental attitude. For our business. To make it look better and perform better. To assist and help my co-worker. To impress my customer. Both present and future. Last Friday my wife and I flew to Melbourne for the weekend to attend an outdoor concert. On our morning flight from Sydney we were treated to not one but two “Above and Beyond” experiences by our flight crew. Firstly, when our flight attendant found out from my wife that she and I were both suffering from the flu virus, she stepped up and brought us both a cup of hot water with a slice of lemon and a sachet of honey to add. This small act exactly hit the spot dead-centre for me. It was precisely what I needed to lift my body out of its misery and to raise my spirits. Traditionally, when someone with the flu identifies themselves in a crowded space there is an avoidance behaviour created by those around in a determined effort not to become the next infected victim. However, our flight attendant Renee took on the role of Florence Nightingale and really went out of her way to help lift our emotional spirits and our physical feeling as well. The second “Above and Beyond” moment that we experienced actually happened before take-off on our short flight when our male steward David came to both Jayne and I and asked us which of the three meal options we would like to be served once the plane was in the air. The reason this was a special moment was that we noticed that he did not approach any other flyer with this question. Rather, all other travelers were only given their choice when the food trolley was brought out to serve the breakfast. Whereas Jayne and I received our meals prior to the food trolley service. We put this act of “Above and Beyond” down to the fact that the crew had been alerted to the fact that my status as a Qantas customer had recently risen into the top bracket as a result of all of the flying that I had completed this year with them. These two “Above and Beyond” experiences are great examples of EXACTLY what all organisations should be doing in their businesses to make their customers feel special. Firstly, always be attune to making sure that your team are aware of exactly HOW your customers are feeling physically and emotionally when they enter your premises, and make sure that your staff are looking for ways of helping to lift up those feelings. Secondly, always make sure that your staff are aware of exactly WHO each customer they are serving could be, and whether they are a loyal customer of long standing, or a significant spending customer. Both long term customers and big spending customers have chosen to do business with your business for a reason, and as such, they deserve recognition and our appreciation of their choice of doing business with us. If we ignore our loyal customers they will leave us and take their business elsewhere. We must ensure that our business always has the systems in place that enable our staff to consistently exceed our clients’ expectations and make the client feel welcome, comfortable, important, and understood. If we do that in our dental office, we will indeed create an Ultimate Patient Experience for our clients, that keeps them returning to us each and every time they need our services. It is these simple EXPERIENCES that create the loyalty…. Business Is As Business Does. Business is not a hobby. If you do not treat being in business like you are in business then you will never truly realise your true potential as a business owner. It really is a case of having to put on your “big boss boots”. Firstly, a dental business does not succeed when the owner is chopping and changing things with no clear purpose. Change for change sake is a waste of time and energy. Change should only occur to create improvement. Be regular. Be consistent. Be purposeful. 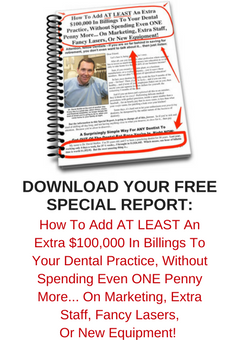 When I worked as an associate dentist, and when I worked in my own practice when I purchased it, I was always there at the practice from start time to end time. Because you never knew who was going to want to see you at any time. And if you were not present, you would always rue the opportunity of helping out that very appreciative patient that needs you when they need you. Who would most probably become a customer for life. And become a great referrer too. Remember, it is your business. Treat it like a business. And not like a convenience. Your convenience. Secondly, trust the force and believe in yourself. If you are a great dentist and a great person and offer a great service and a great experience, then charge an appropriate fee that represents that. And not one penny less. The twenty five percent of the population who value and seek out such a dentist and are sick and tired of being treated like a lemming or a number by some other practice that doesn’t care and they will beat a path to your door. And as Pareto says, those top twenty percent of the population will reward you with eighty percent of your income. If you are worth it then they will pay. Vision, belief, and persistence and hard work WILL be rewarded. If it has been done, it can be done.